Driving in to Bundi from the train station, through the flat, dusty unpromising outskirts, did nothing to portend charm, beauty or cultural significance. But then the road veered around a mountain and the valley bowl that holds the ancient town appeared. 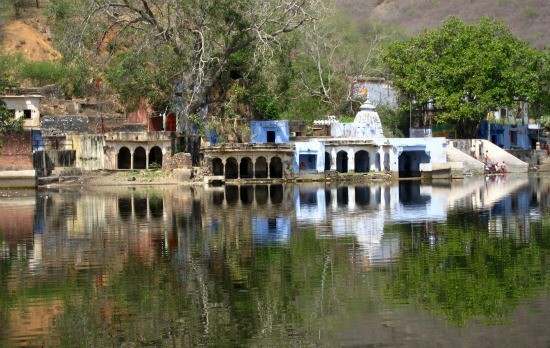 Nawal Sagar, the artificial lake, lay at the centre, dotted with shrines, covered in leaves, and surrounded by crumbling palaces and havelis. On the far side, an improbable gothic palace – made by goblins, according to Rudyard Kipling – hung from the far mountain, providing a dramatic backdrop, and a medieval fort ran across the top. I was instantly fascinated. We drove right into the heart of the old town, parked, and began walking up a sloping, narrow lane. As the lane twisted and turned, and the walls and protruding, carved balconies of decaying havelis closed in around us, I got the distinct feeling that I had entered into an altered state – suddenly I was in medieval Europe, perhaps walking up a Venetian alley. 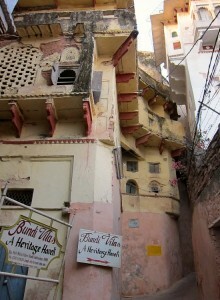 Finally, the alley led up a ramp to a very, very high arch: the entrance to my hotel, Bundi Vilas. 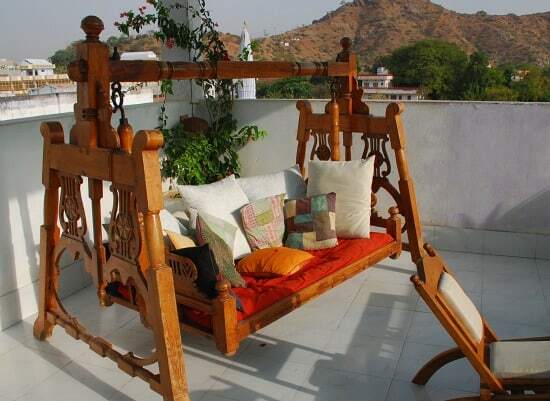 Read about this wonderful place Bundi Vilas: The perfect haveli hotel. 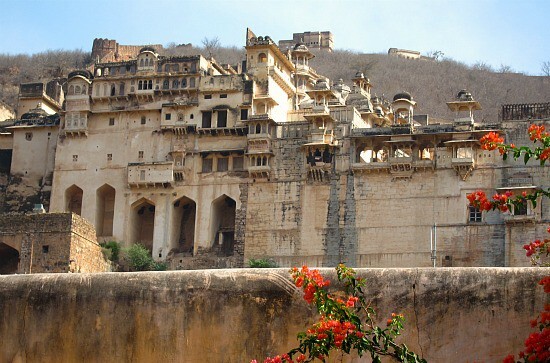 I was beginning to get a sense of Bundi’s history and allure. 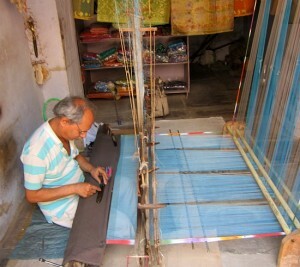 And over the next three or four days, as I toured the town and the outlying area, met the people and enjoyed the hospitality of the charming Sharma family – who own and run Bundi Vilas – I developed a deep affection for this small, almost-out-of-way and not-quite-forgotten Rajasthani town. On my first evening in Bundi, I had dinner on the rooftop terrace of Bundi Vilas, which is right under the shadow of the Garh Palace. This is the building that Kipling described when he said: “It is such a palace that men build for themselves in uneasy dreams; the work of goblins rather than men.” As darkness fell, gold-coloured spotlights lit up the exterior, revealing the shadow-black gangly frames of rhesus monkeys crawling across the macabre facade. It was a gothic and spooky sight – and reminded me of the flying monkeys and the witch’s castle in the Wizard of Oz. This was the night that the India Team won the Cricket World Cup. I watched with hotel manager Arun Sharma, and some employees, in the lobby, and we all danced and cheered when M.S. Dhoni hit the sixer to win the game. We went up on the rooftop and watched as Bundi celebrated – people lit fireworks and a din and roar was heard coming from the direction of the market. And we knew people all across India were similarly celebrating. One billion hearts beat as one that night. What fun. The next morning, the first order of business was seeing the Garh Palace and the Taragarh Fort, and the Sharmas had arranged for me the best guide in Bundi. Billoo Guide is all business. I have rarely seen a more professional and enthusiastic guide in India. He trotted ahead of me, arranging everything, unreeling the same spiel he has used for 20 or more years – and yet, I felt he was genuine, and I grew very fond of him. He made the experience special – which, actually, would not be difficult because I was really impressed with the Palace. 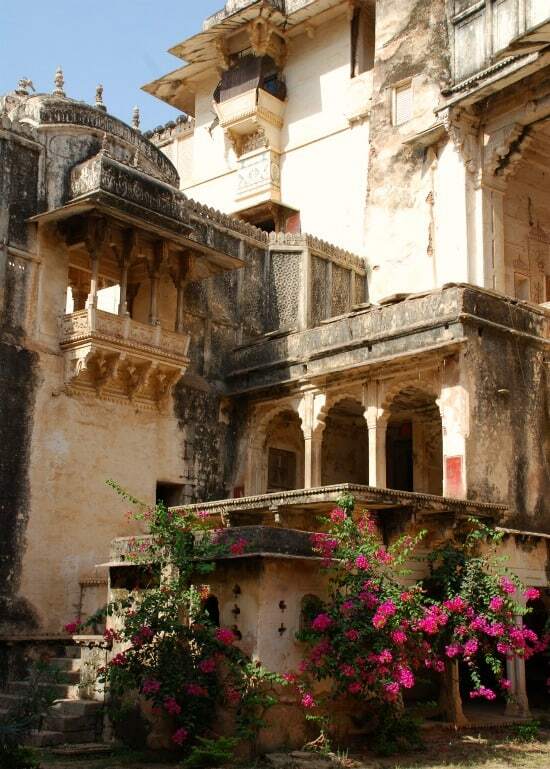 The building itself is interesting -– it was built in three parts, over a span of hundreds of years, and is a rare example of almost pure Rajput architecture. But what’s really thrilling is the art. 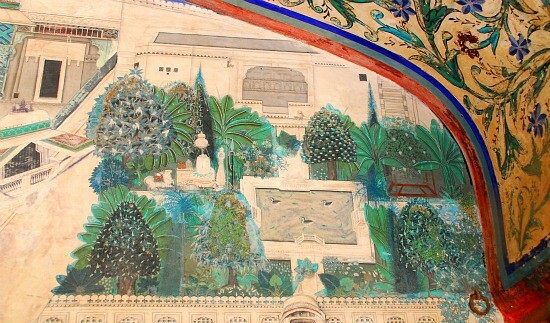 The Palace is filled with exquisite wall paintings. I may do an entire blog post about this Palace; it deserves it. It also deserves better care. But more about that contentious issue later! Another Wizard of Oz moment came when Billoo led me up a staircase with a metal trapdoor at the top (he called it the VIP entrance), to Chitrashala. He opened it and I beheld a lush, bright green garden, dotted with tropical blooms in red, pink, fuchsia. It was a gorgeous site after several hours of touring dry, dusty, stone rooms. And at the back of the garden was the piece de resistance: a large, airy room filled with paintings of Maharajas, Maharanis and other royals rollicking in this very garden. This is the magic I come to India for! In the afternoon, I walked around Nawal Sagar, the artificial lake, and was so disappointed to find, up close, that it is muddy and smelly, and the lakeside Moti Mahal going to rack and ruin. I love Bundi, it is a special place, but it’s heart-breaking to see so many treasures so badly neglected. That night was the start of Navratri, and I went with Mrs. Anita Sharma and her feisty and fun 20-something daughter, Jaya, to a very old Durga temple, out of town, in the countryside. It was dusk when we arrived and it was a very atmospheric place. The temple was obviously in long use, was covered with the grime of ages, and seemed to be growing organically from the ground. I was, of course, an object of fascination – while I was fascinated with the ancient pooja. We got there right at the right time: we stood in the dark centre of the temple enclosure while all the men started clanging bells and making a lot of noise, and the pandit came out from the inner sanctum and blessed us all with fire and prasad. Wow, it was another stepping-back-in-time moment; a moment that evoked the ancient mysteries, powerful beliefs and lurid rituals of Hinduism. On my second day in Bundi, I met Billoo in the morning and we walked through the old town, through the market, to the bicycle rental. After choosing two of the better bikes (they all looked like they’d been around since the dawn of independence), we started cycling out of town to Jait Sagar Lake and the Sukh Mahal, otherwise known as “Kipling Palace” – the former Maharaja’s hunting lodge, on the edge of the lake, that played host to Rudyard Kipling for a few days in the 1880s. It is said he wrote part of Kim here. And as Kim is my all-time favourite book, cycling out to the “Kipling Palace” was a kind of pilgrimage for me. 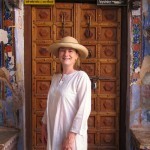 It was also the day my disorientation and re-entry ended, and I reconnected to the India I love. If you haven’t experienced it, how can I tell you what it’s like to cycle out of the charmingly dilapidated town of Bundi into the countryside, past the busy commercial fringes of town where tradesmen are engaged in an array of road-side activities, past temples of every size emitting joyous devotional music and the evocative scent of incense, past old women sitting in the dust pounding rocks, past chai stalls shaded by abundant banyan trees, past men in colourful turbans sipping chai and women in neon-bright saris balancing large brass water jugs on their heads and walking with a sensual rhythm? How can I tell you about the decaying beauty of Rajput architecture dotting the arid landscape and the undulating Aravalli hills? Or about the freshness of Jait Sagar Lake, partially grown over with bright green lotus pads, in readiness for the gorgeous blossoms? How can I express how refreshing I find these scenes, the people, this culture? All the health spas and medicines and treatments and luxuries in the world could not give me what a morning’s cycle, with my guide, Billoo, gave me: The beauty, friendliness, cultural richness and sunny skies of Bundi revived me after a long, hard year of work and a cold Canadian winter. 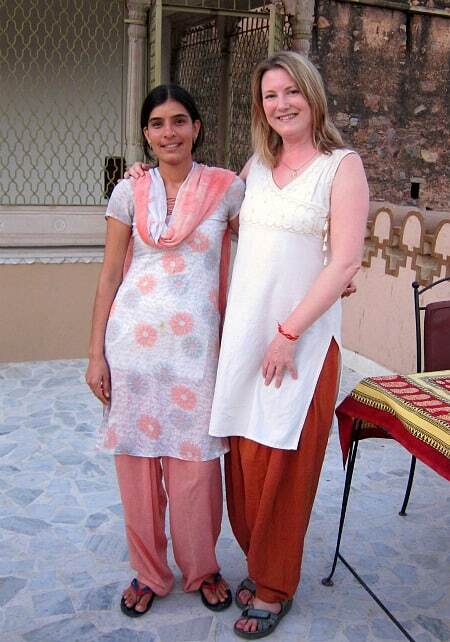 Being in Bundi refreshed my spirit and re-sparked my imagination – and the spark rekindled my deep love for India. 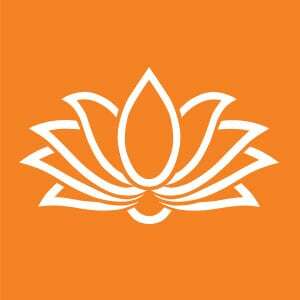 I loved “Kipling Palace.” I sat meditating for some time in his room (though I know this could be a fiction), and I loved cycling around the lake, imagining it covered in lotus blossoms (they bloom in late April). On the road, we met Rajinder Singh, the nephew to J. Singh, who manages the properties for the Maharaja and I asked for an interview. On the way back, we stopped at the vegetable market and the Rani ki Baoli – the number one stepwell in Asia, according to Billoo. It was indeed a marvel – and I was olstered to see the archaeological society actually working on it, to repair and restore it (I hope). My second-to-last day in Bundi I went shopping with Arun in the morning. Though he was busy with his management duties, he took time out to show me the best shops, selling genuine and good quality merchandise. 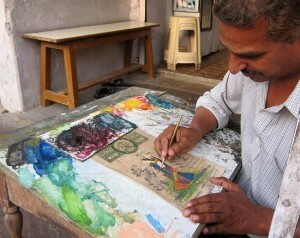 I had the most fun with the very modest and gentle artist, Soni Gopal, Bundi’s number one painter. Bundi has a unique painting style that features lots of blues and green and nature motifs. I bought four paintings, as many as I could afford. I know a good deal when I see one! I also bought handmade bangles, studded with rhinestones – a specialty of Bundi – and a Kota Doria sari, handmade on a loom right there, in the store, by the man I bought it from. I fell for the delicates shades of green and turquoise that shimmer in the light. None of these things were particularly pricey. In Jaipur or Delhi, they would have been four times the price. Another reason to love Bundi. I had a great time with Arun, who walked me through side streets that normally tourists never see. And another great thing about Bundi: no one pesters you, no one tries to get you to buy anything, children don’t follow you saying “school pen,” men don’t plead “just see my shop, madam.” It is very liberating to just walk the streets almost anonymously. 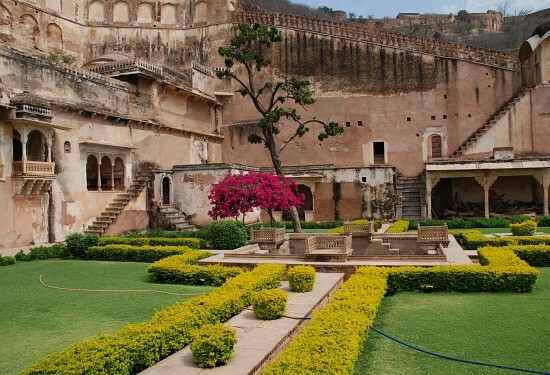 Though Bundi is a modest town – not an architectural wonder like Jodhpur, Jaipur, Jaisalmer or Udaipur – it is nonetheless filled with small, exquisite buildings, many of them private homes, that have seen better days. Everywhere you look, in the old city, you see intricately carved balconies or painted facades or other charming features. There are also more than 50 stepwells, many of the quite impressive, and an uncountable number of temples. 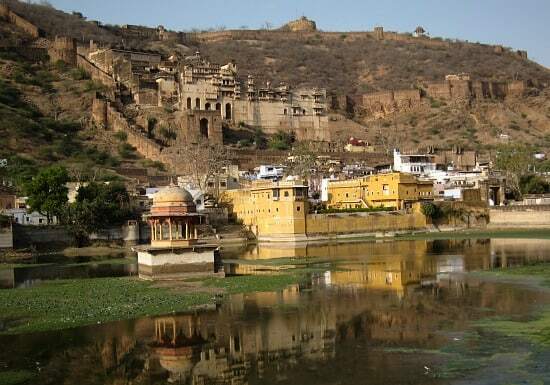 Someone told me Bundi was like a small version of Kashi (Varanasi). My last day in Bundi was to start with a program arranged by Rajinder and J. Singh. I had met with them the day before and talked to them about Bundi. 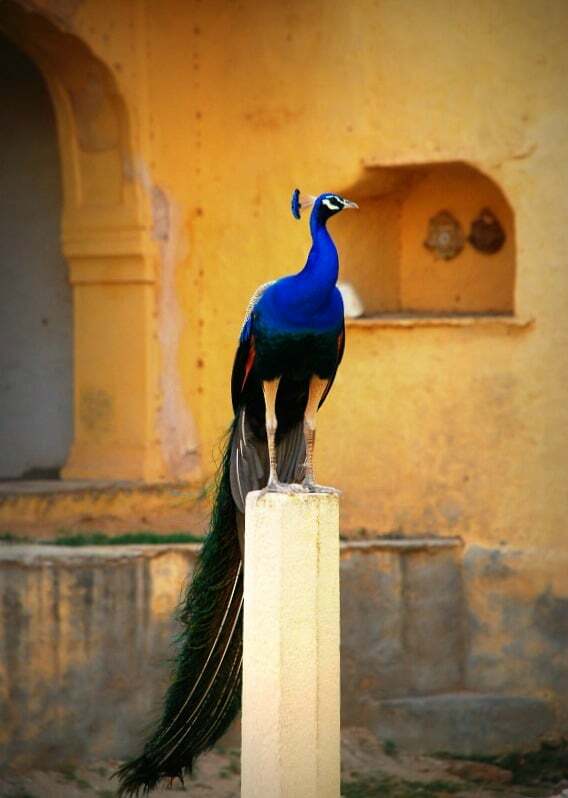 They manage the lake, the palaces and the fort for the present-day Maharaja. Many of the treasures of Bundi are privately owned so the government cannot simply undertake to restore them, even with a will. I tried to diplomatically tell them that I thought Bundi was very special, but would be even better if restored. The Singhs offered to show me some of the other treasures, usually unseen by tourists, but they had to cancel at the last minute due to some emergency. Somehow, I was not surprised. Their hearts didn’t seem to be in showing foreign travel writers around. I found them to be cordial, but reserved and inscrutable. 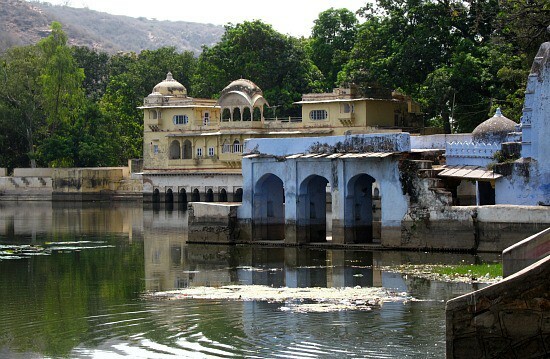 The situation in Bundi is quite complex as the former Maharaja died in January 2010 and there is a dispute over the will and the priceless properties he owned. So, I guess everything is in a kind of “lock-down” until the dispute is settled. I just hope nothing is ruined, spoiled or lost until then. So, I hired an auto to take me to the Kshar Bagh, the cenotaph garden on the edge of Jait Sagar Lake (which was closed the day I cycled past it). Another evocative place! I sat and meditated – while keeping an eye out for monkeys and snakes – and could barely believe I was in such a scene. It really was something out of Kipling or Merchant and Ivory! 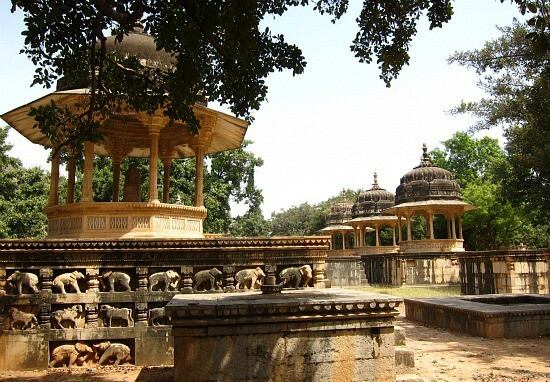 Elegant old, crumbling tombs, overgrown with vines, on the edge of the lake, with the rolling Aravalli Hills in the background, and a complete sense of peace, otherworldliness and the dull patina of a glorious former age. Very much an “it and I have decayed together” scene. Finally, on my last evening, Arun took me out of town to a very, very old Shiva temple. It’s really just a cave, with a concrete bunker built around it to protect it from rock fall. You have to walk a long way up a gully to get there, which would be beautiful in monsoon, as it is beside a waterfall and pool. Inside the cave I got a feeling of intense energy; very hard to describe, but unmistakable. Dark, powerful, mysterious. Coming out with prasad in my hand, a big, tall langur – the gentle grey monkeys with the black faces – put his hand lightly on my arm. It was a not-unpleasant, very novel feeling – to have a monkey in the wild gently place his hand on your arm. I immediately threw my prasad on the floor for him to eat. That night, as we were eating dinner on the rooftop of Bundi Vilas, the Gangor festival (part of Navratri) procession passed by the lane to the hotel and Jaya and went running out to see it. It was a joyous, wonderful, colourful way to end my four days in Bundi. 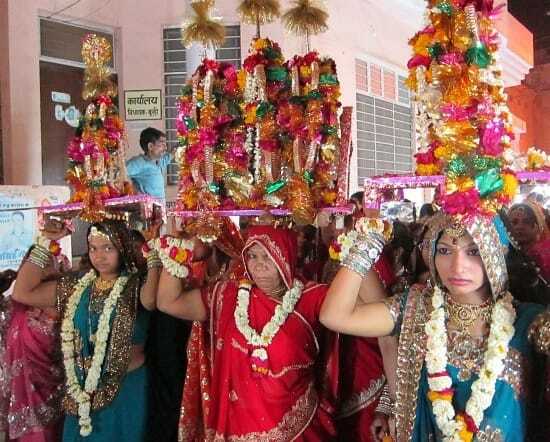 All the women in town get dressed up in their finery and parade various murtis (statues) through town to the raucous sounds of a live band. I left Bundi feeling intensely satisfied – with the town, with my experiences, with meeting the Sharma family and with staying at Bundi Vilas. I took the night train to Delhi – and slept soundly the entire way!